SC to SC Fiber Patch Cords with Multimode 62.5/125 OM1 Duplex Cables. 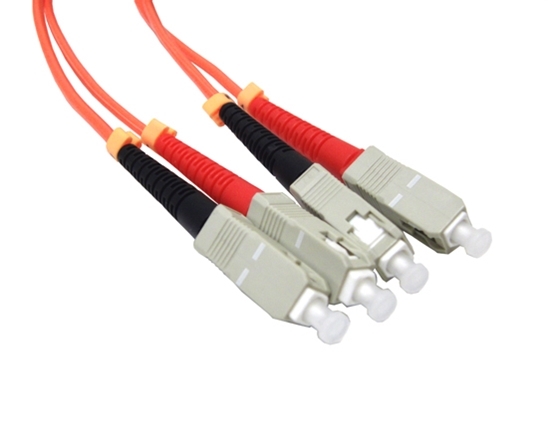 These multimode 62.5/125µm duplex fiber optic patch cables are terminated with SC fiber optic connectors on both ends (SC-SC). Referred to as Subscriber Connectors, Square Connectors or Standard Connectors, these push-pull connectors are the most common choice for FTTH (fiber to the home) applications in use for Datacom and Telcom; most GBIC modules also require this connector type. Our extensive range of fiber patch cables are terminated with state-of-the-art connectors and available in any combination of ST, SC, LC and MTRJ with PC, UPC or APC polish types to meet your standard or custom configurations. Our fiber jumpers have been geometrically inspected with interferometers and tested with automated insertion loss and reflection test equipment to ensure exceptional performance.